Editor’s Note: Igreja Evangelica dos Irmoes, a Grace Brethren congregation in Uberlandia, Brazil, recently celebrated its 30th anniversary. Several missionaries who served with Grace Brethren International Missions (now Encompass World Partners) and were an integral part of the beginning of the church were invited back for the celebration. Norm Johnson remembers being approached by a family in his Brazilian neighborhood to pray for a woman who was dying of cancer. “The priest had been called different times to come, but never appeared. [The sister-in-law] said, ‘I understand that you pray for people,’” recalls Norm, who served with Grace Brethren International Missions (now Encompass World Partners) from 1975 to 1987. Maria, the patient, was a mother with four young children. Norm prayed with her. He cried out to God throughout the night to not let her die until he had an opportunity share the gospel with her the next morning. God gave that opportunity and she received Christ, complete with a visible joy that came over her. She lived for another five months to be discipled by Barbara Hulse. It was the beginning of a Grace Brethren congregation in Uberlandia, Brazil (Igreja Evangelica dos Irmoes) and this year the church marked its 30th anniversary in May with invitations to former missionaries to help them celebrate. 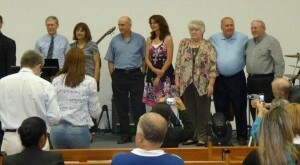 Johnson and his late wife, Cleo, along with Hulse and Tim and Sandy Farner comprised the first church-planting team at Uberlandia in the mid-1970s. When the Johnsons and the Farners left the field, Dan and Nancy Green stepped in. 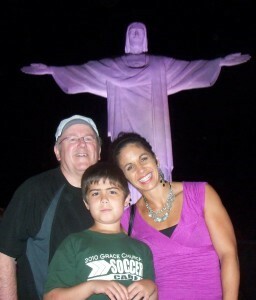 Today, Bruce and Lisa Triplehorn are the mission staff in Uberlandia. Returning to Brazil for the week-long celebration was Johnson, along with his daughter and grandson, Heidi and Micah Bogue; the Greens; and the Farners (and their sons, Jonathan and Jay and their families). Many special events took place during the celebration. Area Grace Brethren pastors spoke, missionary guests shared, and the church family participated with testimonies. Norm adds, “Word spread that the early missionaries were back and people who were not necessarily part of the church came to see us again! Each night the church was full. One night in particular, about 450 people packed in. Judy Daniels is a freelance writer and former editor of Grace Magazine. She and her husband, Denny, live in Winona Lake, Ind.